Yokohama 横浜 is our one and only side-trip from Tokyo, a spur of the moment decision as recommended by one of our JaPinoy friends Kiko the day before. We were supposed to go to Kamakura to visit the hydrangeas-filled temple garden, but decided to go for the one with lesser travel time (Yokohama is less than 30 minutes from Tokyo via train). We only had a glimpse of this city, but it is said to be the 2nd largest city in Japan. It has a big port area which reminded me so much of Kobe. Formerly a small fishing village, Yokohama is now known as one of Japan's major cities. By 1859, their port was the first to open to foreign trade. Our first agenda: The Cup Noodles Museum, which is walking distance from the train station. Going to a cup noodles or ramen museum has been brought up for the entire trip, ever since we landed in Osaka (haha, true story!). So when we had another chance to visit one near Tokyo, we took it as a sign to not let this one slide. Entrance to the 5-floor museum is 500 Yen (or Php 225 only). We wanted to make our own cup noodles, so we ran to the CupNoodles Factory. The purpose of the CupNoodles Factory is for the guests to get creative and make their own original Nissin CupNoodles from the design, to selection of your favorite soup from the four varieties, and adding four toppings from their 12 ingredients. You can create up to 5,460 combinations! Ang daming tao! Parang siyang DIY blog event, haha! Good thing the shifting is fast and very organized. We then lined up to have our cups filled with the dried noodles and all the flavors. Like in a real factory, they required us to sanitize our hands before proceeding! We also made our own bubble bags - not sure what this is for but it's kawaii! The whole thing made me hungry, so we went to the Noodles Bazaar! This is the food court of my dreams where all sorts of popular noodle specialties from all over the world are served! Noodles Bazaar features eight varieties that Nissin founder Momofuku Ando encountered during his travels in search of ramen's origin. I spotted Lucky Me somewhere!!! We also watched a short documentary at the Momofuku Theater where we learned cup noodles' history and its founder Momofuku Ando. They provided earphones for English translation, and their method of presenting information is so entertaining and heartwarming! Went out of the theater inspired. He was almost 50 years old when Momofuku invented the world's first instant noodles - the original Chikin Ramen - after several trials and errors. You are never too old to succeed nga naman. He diversified, created a version of instant noodles on a cup for convenience, and the world's first space ramen! Momofuku did not let the growing copy-cats and competition wear him down. He founded the Instant Food Industry Association and Ramen Manufacturers' Association to set guidelines and standards for fair competition and product quality. More than just a Cup Noodles Museum, to me it is actually an entrepreneurship and business appreciation museum! After the Cup Noodles Museum tour, we decided to go back to our home-base in Shibuya just because most of the attractions in Yokohama close early. We weren't able to go to the Ramen Museum (iba pa sya, hahaha! ), but at least for now the Cup Noodles experience was enough. Back here in Manila, I opened my concocted vegetarian noodles just two days ago in an attempt to refresh my Yokohama memories before creating this post. It was warm and rich, but bitin. Perhaps just like this Japan trip. #hugot #naconnectkopayon HAHA! Going back, we passed by and decided to go around Queen's Square Yokohama - the mall connected to the train station which is also a characters shop heaven! You'll find characters stores just in this mall from Disney to Pokemon. Heading up to the giant Snoopy! I like the Doraemon - Hello Kitty Collab! Jiji Wreath! And hanging Totoros! I think Kiki is my favorite Ghibli character of all time! Although simpler than the other Hayao Miyazaki anime plots, I find it empowering and relatable! Made this photo quote for Pinterest, hehe! 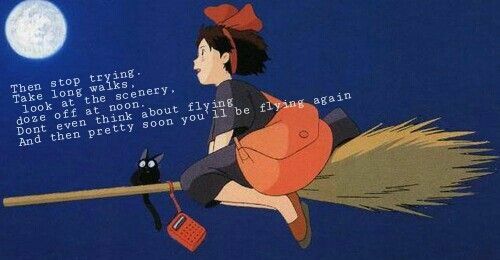 Kiki's Delivery Service taught me to stop when I'm tired; that these long breaks and pauses are not pitfalls but crucial in creating a more sincere and beautiful work. Goes well with flying.. and even in blogging! Connected to Queen's Square Yokohama is The Landmark Tower. Located at the top floor is the Sky Garden where you can spot Mount Fuji on a good day. We asked before entering, and learned that the cloudy day and the rains made it impossible to see this elusive wonder. Strike 2, Mt. Fuji! Back in Shibuya, we parted ways and tried last minute shopping, but most of the establishments close early as in 8pm palang. :p Pax and I went together and dined in a random ramen place with super huge serving size! Ahh, satisfying after the cup noodles museum tour! Haha! When we went out, made sure to check the restaurant's name for blogging purposes, and it turned out to be Kamukura! Hala! Nagpaparamdam our supposed original side-trip from Tokyo (Kamakura), medyo nakakaloka! Your post made me regret that I didn't go to Yokohama! 😑 My friend in Japan (who also name Kiko haha) recommended the noodle museum too but I didn't know that it is interactive. Looks so fun!